During these cold winter months I have to be careful what kind of soap or body wash I use. My skin is very dry and gets really itchy during the cold months. The last several weeks we have all been using the new Dial Body Wash & it leaves my skin feeling very moisturized throughout the day. I like the new body wash because it helps maintain soft skin and has lotion infused, but my 9 year old daughter loves it for the scent. As soon as she saw the label on the package she couldn't wait to see what was inside. She had the box open immediately to see what scent we received. She loves the smell & I am happy that it is a mild scent. The new Dial Vitamin Boost Body Wash Lotion Infused is an advanced formula that helps draw vitamins and moisture to your skin. It contains vitamin B because it naturally helps draw in moisture to keep the skin hydrated. There is also a new Oil Infused Vitamin Body Wash with Super C available. I have 3 coupons valued at $3.00 each for Dial Body Wash. Two coupons are for the New Dial Vitamin Boost Body Wash and one is for the Power Scrub Body Wash for men. 3 of my readers within the United States will win a coupon by entering the Rafflecopter below. 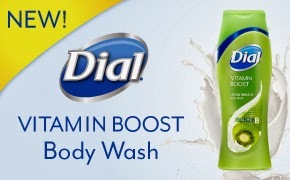 Disclaimer: I received a sample of Dial Vitamin Boost Body Wash from the Dial brand in exchange for my review. No other compensation was received and all opinions are my own. I would like to try the Dial Lotion Infused Body Wash with Vitamin B.
I think I would rather have the Dial Lotion Infused Body Wash with Vitamin B.
I would like to try the Body Wash with Vitamin B.
I'd like to try the Dial Lotion Infused Body Wash with Vitamin B.
I'd like to try the Dial Lotion Infused Body Wash with Vitamin C.
I would like to try the Dial Lotion Infused Body Wash with Vitamin B because it should go well with my kiwi shampoo. I'd love to try the Super C! I would love to try the infused body wash! I;d love Oil Infused Super C Body Wash. I would like Dial Lotion Infused Body Wash with Vitamin B.
I'd like to try the lotion most. I would rather have the Oil Infused Super C Body Wash. I would like the Dial Lotion Infused Body Wash with Vitamin B.
I would like the oil infused Vitamin C.
I would rather have the lotion infused over the oil.